This will be the seventh year I have joined this ad hoc sword party and public exhibition/event. This year is hopefully a little drier. We had about two+ inches of rain that Saturday but some of use still showed up for both days. With better weather hoped for, the internal circle of interest looks like it will be a great year. 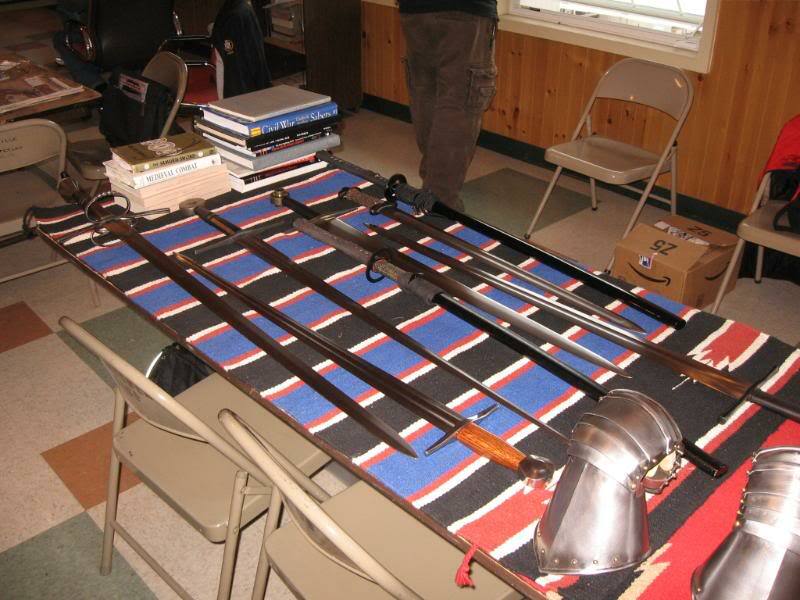 More and more 18th and 19th century swords are joining in with a mix of now even Albions filtering in to a fairly diverse assembly of tables. There will be militia re-enactors and a Native American Pow-Wow scheduled for the weekend. The rifle range activities continue with hands on use of some pretty interesting guns from black powder to a .50 Barrett. Some of these things, such as a food station are a buy tickets kind of deal but the admission itself to the event free. I think it has been four of five $1 tickets to go bang with the Barrett. Cowboy Action shooters and music are regular attendees. The hope is always for more vendors to participate but they are often busy weekends. This year is a full week after the equinox. We will always enjoy others stopping by or even spending more time with more stuff if some want to. We had a very nice chat that very wet Saturday in in just talking talking with a well knowledged antique naval collector. We even put a sword in his hand to cut up a mat. This may well be another year that Dennis Boas will check in with the Cashen collection he and his wife have. Those are always a nice treat to see and handle in hand. There is always a thought that some other sword groups will show up but they have not dojoed up, while some occasionally dropping by. There are usually some cutting supplies and that is as yet to be finalized or ordered (afaik). There will be at least one stand there that we have put it to use, even the one year without mats. More stuff brought to cut is cool too. BYO stuff that will help anyone enjoy a longer visit will be comfortable chairs (but there are plenty of folders we and others can shag from the clubhouse). Refreshment supplements if planning on a longer visit and even camping overnight as long as one contacts the club they are staying over onsite. There are several hotel/motel options, as L:incoln, Woonsocket and Providence are fairly close. The site is about half an hour south of I-90 on rte 146 at the Worcester/Millbury exit.. FAmily friendly and a frinds four year old daughter got a chance to fire a musket. She carried some of dad's swords over from the car while unloading and when I asked if they were her's, the reply was a kind of bored "no, those are my dad's". Both dad and daughter spent most of the day up at the range. There are archery opportunities as well. 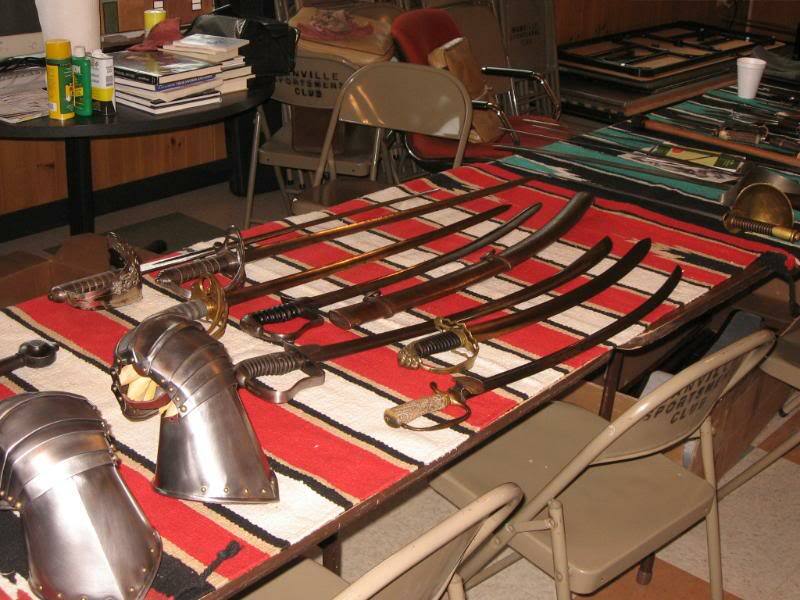 These have been a great opportunity to share time and thoughts with other sword minded folk, as well as discuss both the collecting/use and history with the public. If someone is planning to bring in many pieces, let me know to notify security to let you drive right in to unload. There are shuttles of both a bus and open wagon from the primary parking a few blocks from the club itself, if only bringing a small handful. I know the club is also likely quite open to other vendors applying to set up "whatever". Any interested in that type of venture needs to check in via email or phone to register with them. Although we are not set up to vend and sell stuff, things do change hands and it is another opportunity to connect with something someone might want.. Some dry and wet pictures below from the past seasons. A wet one for sure last year Saturday morning. One thing I need to pursue the club if it does get really wet again is to let us do the bulk of the tables and activity inside. Plan b wet may be a real chance for success in that setup. A quick update in adding a link to the club's official link with a flyer. While kind of in the boonies location wise, an easy day trip for some of New England. With Labor Day weekend now pretty much done, the fall season of the northern hemisphere is sure to follow soon. In three weeks, this event will be past as well. I will post any last minute changes but any that had confirmed so far have done so and the three of us will triangulate on that site. Don't hesitate to contact me regarding any questions. One week out from this. Tatami mats have been confirmed. there are actually a few left from last year as well. Good weather is hopeful this New England after all. Consider at least a light jacket if not active. There will be a bit more of everything this year in terms of both reproduction and original arms. If nothing else, an opportunity to interface with the public regarding associated interests. I will be arriving on Saturday afternoon and will be there most of Sunday. 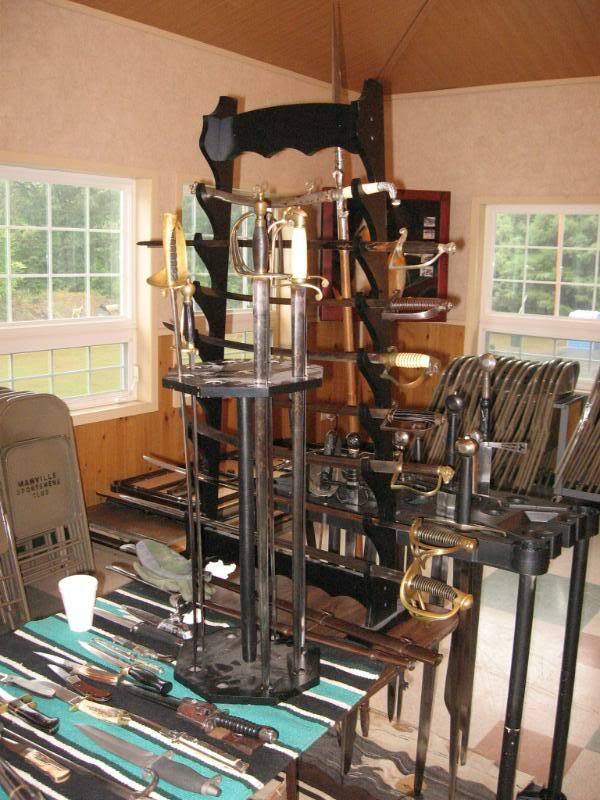 I will have mostly antique British military swords from the 18th and 19th centuries, and the Albion Mercenary that is in the classifieds (if I still have it--hopefully it will sell ). Well you can expect me there. Not sure if it will be Saturday or Sunday, but I shall be present. I missed it last year due to the crappy weather. I'd be happy to bring a couple pieces if you want some more stuff to display. I've got a neat little project poleaxe I just finished up and wouldn't mind showing it off. You are welcome and bring what you would like to. A poleaxe sounds like it would fit right in. I added a Hanwei spontoon I had hafted last year. If you are bringing in a large load, just let them know at the main parking entry area and then you'll be able to drive right in. I'll mention the name to the walkie talkiers in the safety vests. Sounds good. The girlfriend and I will be coming by on Sunday. Hope the weather holds out. All systems go for both days. I will update tonight if there is a serious complication with the weather and/or cancellation for Sunday. Rain is expected at times tomorrow but there will be cover one way or another. We have to remember that history saw wet weather as well. Thanks Josh and Jonathan for coming in. Despite the wet on Sunday, the club has graciously let us move inside for the rainy days. Sunday was pretty quiet traffic wise but that actually makes it easier to spend quality time with answering questions, especially the youngsters that often have an interest to the histories. 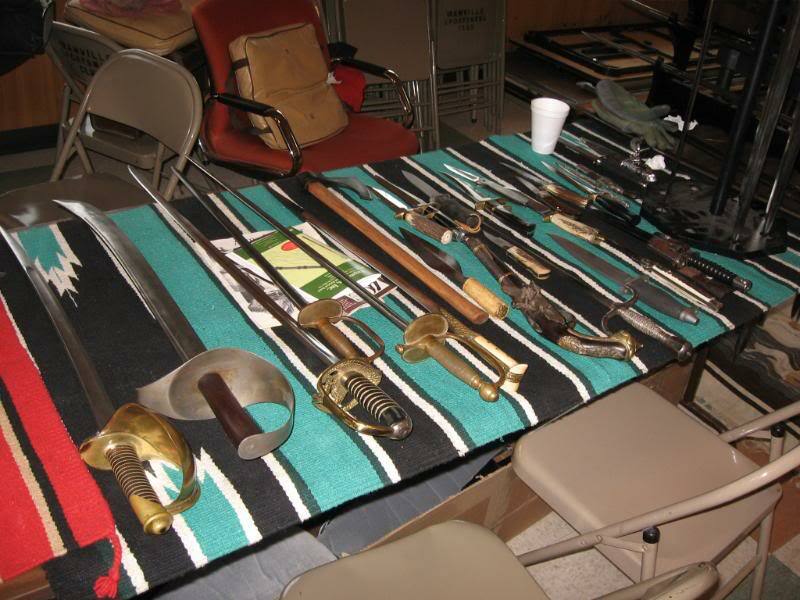 Jonathan was unable to make it Saturday but came with a fine assortment of British military swords. I am liking the artillery swords quite a bit. Todd's gauntlets from Mercenary's Tailor were quite nice. Too big for him and too small for me, they were great fun for a good many visitors to try the out . Josh did come down on the dry day and it was good to have cutters try things out. I managed only one pretty feeble sabre cut but others had a good time. Josh brought a falchion and pole axe. I'm afraid my picture taking was a bit lousy both days but did get a few shots. 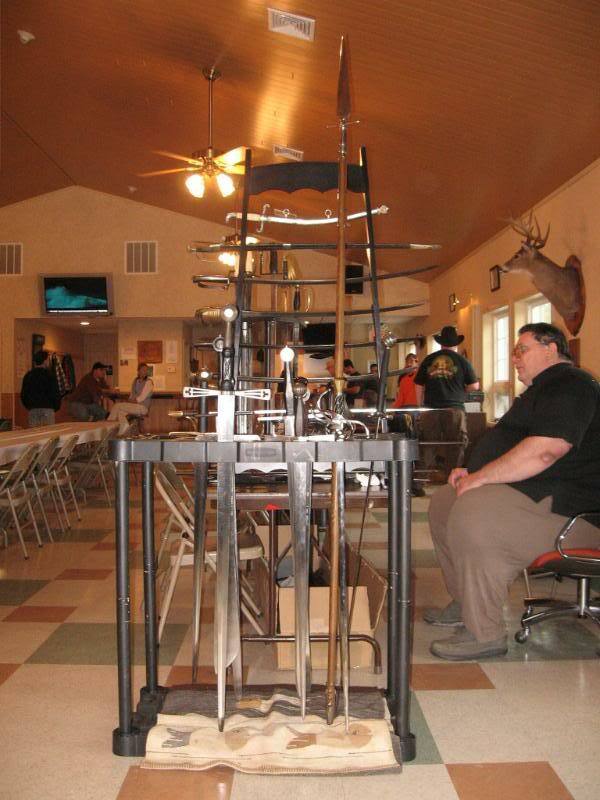 More stands for these weekends have made it possible to condense quite well The cane stand is especially useful at home for he skinny straight stuff. Here with just a few of the spadroons but really handy for the rapier types as well. All in all, a great weekend and good time. Thank you for posting the photos! As always i enjoyed seeing you and Todd and talking swords. I think your collection is about 3x bigger than it was at the 2007 gathering! I, too, did not mind the lower attendance yesterday. It made it easier to talk with visitors and I was more relaxed about the general public handling my swords I wish I could have made it on Saturday. The weather was great, and time passed so quickly that I could have done with another day of sword camaraderie. At least the Hartford Show is only two weeks away! Glen - Thank you for having us come down! Both Lesley and I really enjoyed killing tatamis and seeing your collection. Special thanks to Todd for the pointers on my cutting technique. I always appreciate learning from somebody with experience. It was great meeting both of you and I hope to see you same time next year. Thanks again!